I Toad You So: What’s in Your Bag? Everybody has something going on in the pockets of this carrier of tennis equipment and perhaps a whole lot more. A rather obscene object some clown tossed in my bag at Moose League, but it’s great for a laugh between matches. A spray bottle of sun block which I have never used along with a packet of Capri Sun Sport Drink powder mix stuck to it. A tube of IcyHot with a packet of Capri Sun Sport Drink powder mix stuck to it. Another tube of IcyHot barely used. 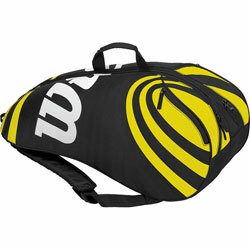 So take a look in your tennis bag and let us know What’s in Your Bag. You may be surprised. The Wilson tennis bag I have been using for over 7 years is still doing great - nothing broken.